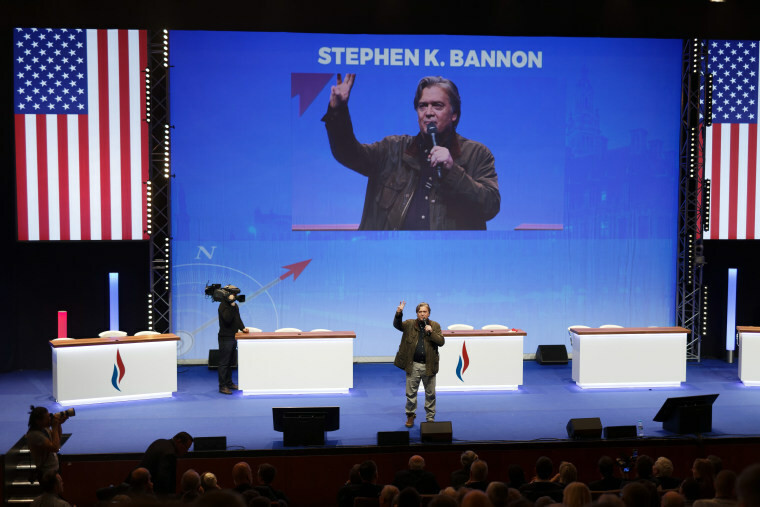 PARIS, France — Former White House strategist Steve Bannon re-energized France's struggling far-right National Front party Saturday by speaking at a party congress and telling Marine Le Pen's nationalist supporters: "History is on our side." Bannon's appearance in France was part of a European tour as he seeks an international platform for his closed-borders, anti-foreigner message that helped Donald Trump win the U.S. presidency. The former Breitbart News chairman was an early admirer of the National Front, whose long-standing "French First" motto rallied voters for years before Trump's "America First" campaign. "Let them call you racist. Let them call you xenophobes. Let them call you nativists. Wear it as a badge of honor," he told the crowd at the party congress. "You're part of a worldwide movement bigger than France, bigger than Italy," Bannon told National Front supporters, denouncing central banks, central governments and "crony capitalists." "History is on our side," Bannon said to hearty cheers. He praised Le Pen's vision of a political spectrum that no longer spans left-right but puts 'nationalists' versus 'globalists.' Bannon gave his first European speech in Zurich earlier in the week and said Saturday that he was traveling the world to learn. The European tour comes as Bannon's role in American politics is uncertain. He was ousted from the White House last year amid tensions and stepped down as chairman of Breitbart News Network in January after a public break with Trump. Bannon was recently interviewed for a total of some 20 hours by special counsel Robert Mueller, who is investigating possible collusion between the Trump campaign and Russia as well as other issues that have arisen around the probe. Despite criticism, Le Pen defended inviting Bannon to the meeting, saying it was important to listen to the man who was "the architect of Donald Trump's victory." Bannon's appearance in France comes just weeks after Le Pen's niece, Marion Marechal-Le Pen, railed against Muslim immigration during a speech at CPAC, a major annual gathering of conservatives near Washington, D.C. The National Front has never won the French presidency, and the congress in Lille — in northern France — is aimed at remaking its image after Le Pen's crushing defeat to independent, pro-globalization Emmanuel Macron in last year's presidential election. Le Pen has been trying to "de-demonise" the party's image since taking over the presidency in 2011 by distancing herself from her father, Jean-Marie Le Pen, who founded the party in 1972 and was runner-up in the 2002 French presidential election. The party expelled its firebrand former leader in 2015 over anti-Semitic remarks but he had kept the honorary position of party president for life. He was stripped of that title Sunday as 79 percent of members who participated in a vote approved new party statutes that included abolishing his position. Meanwhile, Marine Le Pen was re-elected to a new term as president as she was the only candidate for the post. She also wants to revive her own fortunes by changing the name of the party. The new moniker, if approved by members during a mail-in vote, will mark the ultimate break with Le Pen's father, who has called the idea a betrayal. Le Pen said the changes amount to a "cultural revolution" so the reshaped party can "implant itself, create alliances and govern." "We're at a turning point ... don't bury us," she said in an interview with France's Le Figaro newspaper published Friday. The changes pave the way for a younger leadership circle to emerge, even if the party's ideological foundation remains unchanged: nationalist, identity-driven, anti-European Union, according to Jean-Yves Camus, an expert on the far-right. An election next year for members of the European Union's lawmaking arm will be the National Front's first chance to test its rebranding strategy. It won more seats in the European Parliament than any other French party in 2014. However, Le Pen's credibility is among the potential obstacles to a possible far-right comeback: An annual poll published this week by the Kantar-Sofres-One Point firm showed Le Pen scoring lower on numerous questions.